What’s your favorite cruise line? That’s a question I’m often asked when people discover I’ve spent the best part of 30 years writing about the cruise industry. And come to think of it, that’s true. I enjoy each cruise, each ship, and each sea-going experience. Some more, some less, but I enjoy them all. And, after 30 years, you’d think I’d become a bit jaded. “Jaded” is different from knowing what to expect, and the expectations are what keep me climbing back aboard another ship. Basically, there is a ship out there for everyone. Whether you are on a tight budget or the sky’s the limit, whether you are looking for a weekend sailing or a round-the-world cruise; hope to gather the clan for a 50th birthday or to celebrate a college graduation, you can find a ship that’s right for you. Let’s first look at what vessels are available. Carnival, Norwegian Cruise Lines, Disney Cruise Line and Royal Caribbean Cruise Lines offer three- and four-day sailings that are ideal for first-time cruisers, for young families, and for those on a budget. These are large ships with multiple dining venues, children’s programs, large showrooms, several pools and lots of bells and whistles. In the middle of the market are lines that include Celebrity, Holland America, Norwegian Cruise Line, Princess and others. The majority of cruises are one-week long. These lines offer lovely new vessels, multi-national crews, fine dining options and amenities galore. Consider ships with ice skating rinks, rock climbing walls, bowling alleys and golf simulators. Two lines which bring European culture and cuisine to the North American market are Costa and MSC. Both Italian companies accent the Italian in décor and cuisine. Entertainment is multi-national and the lines, which both sail out of PortMiami, offer one-week, 10-day or two-week itineraries. 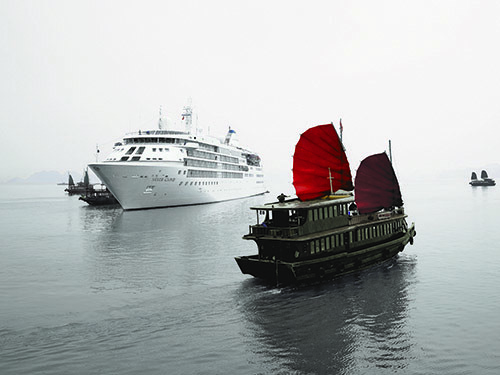 At the luxury end choose from Crystal for the wonderful big-ship lux experiencer or Seabourn, Silversea or Regent for a top-drawer cruise on a smaller vessel. Another option might be a seven-day transatlantic crossing from New York or Southampton and across – a true majestic experience aboard Cunard Line’s Queen Mary2. So now that you’ve a basic idea of what’s available, let’s talk about celebrating occasions aboard ship. Suppose Grandpa Joe is turning 75. Twenty or so family members who would want to be on hand for a celebration, enjoy being together and don’t want the hassle of “where are we going to eat,” “what are we doing today,” etc. will find a cruise celebration ideal. 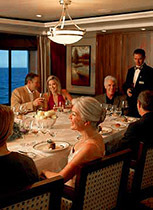 Cruise lines will help with plans such as organizing a private cocktail party or specific tables in the dining room. Ships have babysitting services and children’s activities, (a kind of day camp goes to sea,) and everything to make the party memorable. I did a crossing last summer on Queen Mary 2 with two women, and the newly minted college grad daughter of one of them. They’d flown to London, gone to Wimbledon and were coming home in style on QM2. All three enjoyed the experience. When my husband and I celebrated our 40th anniversary we took our kids and grandkids for a weekend cruise aboard Carnival’s Fantasy. I think there were 11 of us and all had a good time. For our 50th it was just the two of us and we wondered around the UK for a week or so, then flew to Monte Carlo where we boarded Crystal Serenity for a 10-day cruise in the Mediterranean. It was marvelous. On the other hand, close friends celebrated their 50th with 42 family members and friends and thought it was much better than anything they could have planned on land. Romantic getaways bachelor parties or girls’ getaways are other popular reasons to sail In fact Crystal Cruises has been chosen “America’s Best in Travel” in the luxury cruising category of the 2013 Women’s Choice Awards – the only award recognizing brands and companies recommended by women, to women. As I write this, four friends of mine, women who are all single at this point in their lives and have played mah jongg weekly for 40 years, are on a week-long cruise. They’ve done this for many years, saving money each week, and left kids and husbands behind in earlier years. Now, three of the four women use motorized scooters to get around the ship, but they’ve never stopped cruising. Simply, there is a cruise for everyone. Find a good travel agent and ask their advice, or venture online to individual cruise line websites, which offer all the information you may need. You won’t regret it. Celebrity Cruises makes sure you have the best experience ever on your cruise vacation, so you will find airy spaces on board, done up tastefully, incorporating designs best suited to complement your lifestyle and at the same time providing you with the utmost comfort and style. Yes, Celebrity is a good choice for comfort, grace, good food and great entertainment. The new ships are delightful. Don’t you just love the lawn? Great memories with friends and family, and seeing great places to boot . Keep going, it sure makes life exciting . Yes. There’s nothing like sailing out of ports, into ports, knowing someone will clean the room (twice daily,) meals are prepared, entertainment planned – and all while you’ve only unpacked once. Great way to travel! what i like about cruising.